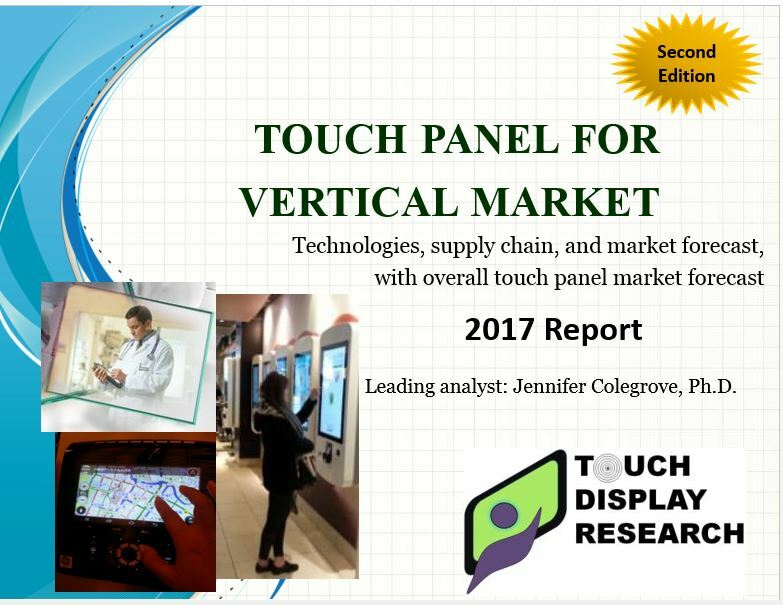 Touch Panel for Vertical Market Attracted 270 Companies - Touch Display Research, Inc.
Santa Clara, California, June 5, 2017— In the recently published “Touch Panel for Vertical Market 2017 Report,” Second Edition, Touch Display Research Inc., a market research and consulting firm, analyzed over a dozen touch screen technologies, and nine non-consumer market applications. Over 270 touch screen suppliers, system integrators, and brand companies working on touch panel for vertical market are profiled, with links to companies’ websites. Touch Display Research defines the vertical market as the non-consumer, or specialty commercial market. We categorized them into 9 applications: 1). ATM/financing, 2). Automobile, 3). Casino gaming, 4). Education/training, 5). Industry/military, 6). Interactive signage/video conferencing, 7). Medical, 8). Retail/restaurant/vending machine/ticketing, 9). Other applications, such as printer/office, home appliances, aerospace, marine. The focus for touch panel intended for the consumer market is low price, low power consumption, portability, and typically less than 3 years of durability. On the other hand, the vertical market demands over 5 years of durability while operating in harsh environment, but is willing to accept a higher price and high power consumption. Colegrove, author of this report, is best known as the first analyst to write a comprehensive report on touch screen industry since 2007. She has conducted many first-hand interviews of touch panel suppliers, system integrators, and brands in the past 10 years. This report provides analysis of over a dozen touch panel technologies, in nine vertical applications. Over 270 companies are profiled and supply chain analysis with many companies is provided. Market data in the report include 4 years of history data: 2013 to 2016, and 6 years of forecasts: 2017 to 2022. The market forecast includes Unit, touch panel module ASP, Revenue, Area (square meter), with detail breakdown by nine touch technologies: Acoustic, Digitizer, Infrared, Optical imaging, Projected Capacitive discrete, In-cell on-cell, Resistive, Surface Capacitive, and Other tech. Regional analysis, haptic feedback technologies are also provided in this report. 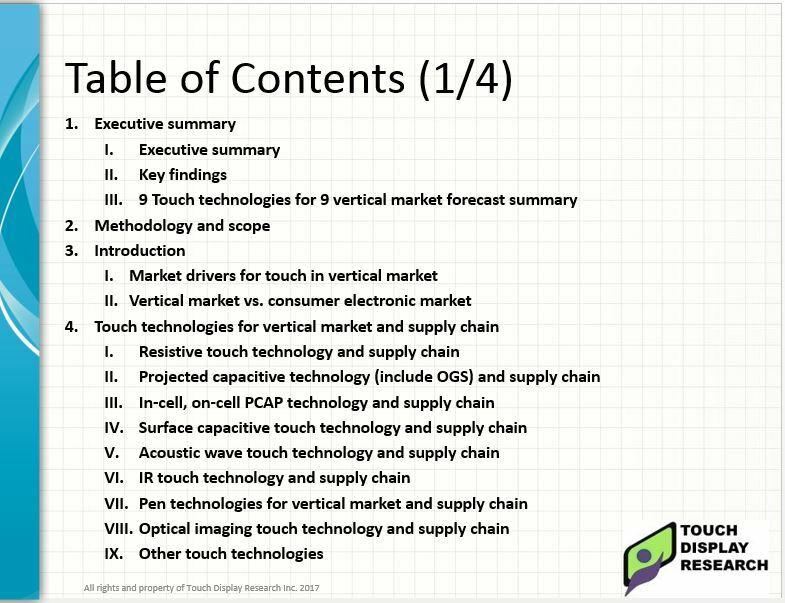 The “Touch Panel for Vertical Market 2017 Report” is available immediately and includes a PowerPoint file of over 250 pages and an Excel database. Source: Touch Display Research, Touch panel for vertical market 2017 report. Touch Display Research experts have been writing touch industry analysis reports for over 10 years. You can access this expertise by purchasing and receiving the report today. The “Touch Panel for Vertical Market 2017 Report” Second Edition is available immediately. Excel database Profiles >270 companies. 4 years history data: 2013- 2016 and 6 years forecasts from 2017 to 2022. Units, ASP, Revenue, Area (m2). Touch Display Research, Inc. (www.TouchDisplayResearch.com) is a technology market research and consulting firm specializing in touch screen and emerging display technologies such as OLED displays, quantum dots, flexible displays, e-paper displays, ITO-replacement, Active pen, near-eye displays, smart windows, pocket projectors, gesture controls, voice controls, and eye controls. Touch Display Research helps technology companies grow and connecting their technologies to the marketplace. We were the first company to publish Quantum Dot market reports, the first company to publish Active Pen market report, and ITO-replacement market report. We have always been there to analyze new and emerging technologies. Touch Display Research provides reports, consulting, and due diligence to touch suppliers, display manufacturers, consumer electronics ODMs/OEMs, material suppliers, investors and venture capitalists. We are member of Flextech Alliance, SEMI and SID.